Chris: So what do you think about the idea of parallel universes? For us to make any sense out of this we need to understand a little bit more about fundamentals of quantum physics. Classical physics maintained that an object or an action can only be what it is and where it is. It cannot be in one position in time and space, and also in another position in time and space at the same moment. However, because of the findings in quantum physics that a subatomic particle when observed is a particle, and when not observed a wave, a new way of looking at the universe had to be arrived at. In quantum mechanics particles can be two things at once. This paradoxical state has been applied to the idea of building a quantum computer. In conventional computers working with digital code, something is either a 0 or a 1. Digital code is built up from a combination of these two numbers. But a quantum computer can work in a paradoxical way. It can calculate using the 0 and 1 as a single possibility. So ‘yes’ and ‘no’ – right and wrong – light and dark are all a part of the paradox and are not separate. One of the experiments in quantum physics is to project a single photon of light to a half silvered mirror that allows the photon to both continue straight on in its direction, and also to reflect it at right angles. Classical physics would say that a single particle such as a photon cannot do the two things at once. It would either continue straight on its path or be reflected at right angles. But quantum physics shows that it can in fact be both at once. These are some of the factors that underlie the statement that there are parallel universes. The nearest I have come to understanding this in any personal sense came about through using the technique of meditation called Enlightenment Intensive. During this something happened that seemed to me to be an experience of the central situation of our universe. It is very difficult to describe, and so I have to use a story to help produce a particular idea or realisation. Are you looking at this from above or from the side? 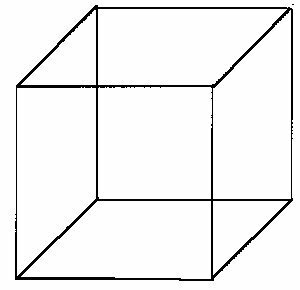 The cube is both things at once, but you can only see it as one or the other – unless you try! So imagine for a while that you are sitting looking at a wristwatch that has a second hand moving around the dial. As you look you notice that the movement stops, and you gradually realise that time has stopped. You begin to think about this, and after many speculations arrive at some understanding of it. But no time has passed. You now begin to think about your life, and in doing so you explore all possible choices you could make, and the directions that could arise from those choices and actions. This is an incredible undertaking, but you finally arrive at every conceivable possibility. But no time has passed. So you begin to think about another person that you know, and likewise you explore every possible direction they might take, and all the consequences that could arise out of being who they are, and what the results in the world would be of the many possibilities of their life. Having done this, no time has passed. In this way you explore every living human being and the consequences of their lives through infinite duration. No time has passed. What I am trying to illustrate by the story is that my experience during the meditation suggested that at the very core of our universe, and therefore of our existence, is a condition outside of time and space. And in that condition every possible direction, thought, action, decision and outcome has already been explored and is, at that level, already a reality. At the time I really felt that each of these realities could have physical existence. At that level, I as a person was in reality all of the many possibilities that I could be. I was a murderer, an alcoholic, a genius, a pervert, an artist, a dropout, single, married, everything! What I sensed at the time, and I still fail to understand intellectually in detail, is that any of those possibilities could be made real in the here and now. I could claim any of those possibilities, and because they already exist, they could manifest in my life now. This, I understood, as being how spontaneous and immediate miracles of healing occurred to some people. But I did see that any part of the huge potential could be made real by building it by actions, as such you work hard at materialising it. When I compare this to Deutsch’s view of parralel universes I feel that there is still a tendency for him to see these incredibly different dimensions of experience in something of a materialistic fashion. Instead of saying all possibilities are here and now in that one amazing state, he builds an idea of lots of copies existing as innumerable material universes. So there are other ways of looking at the possibility of parallel universes. One of these is to realise that our sense organs give us a very limited view of the universe around us. There is the possibility that there are forms of life having no need of a physical body. Just as radio and television transmissions and signals picked up by mobile phones, exist, or coexist, in the space we move around in and make our life in, so other beings can exist and coexist in the space we know without us being aware of them; that is unless we can have an ability to sense and then transform the signal into our own awareness. Many years ago when I had an out of body experience, I stood before my mother and she could not see me. That was very strange because I was very apparent and real to myself. I existed in the same room, the same space, as she did, and yet she had no awareness of me. Yet my dog, who had been asleep in front of the gas fire, did see me and responded. What I realised from this was that if my mother could have been aware of my thoughts and feelings, then she would have known of my presence. But because she, in common with most of us, cannot be aware of what I think and feel unless I express it physically in some way by facial expression, or words, then beings existing at that level are invisible to us. So in that sense we can say there are parallel universes existing with us here and now. We experience this for ourselves daily in being aware of our own personal experiences that are largely hidden from others unless we express them in some way. Therefore the universe of our own person coexists with the billions of other unique universes around us.